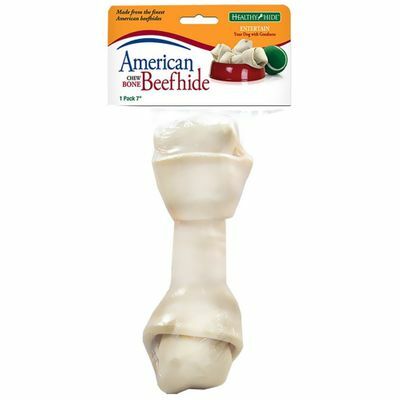 Healthy Hide American Beefhide Natural Bone 7"Healthy Hide American Beefhide Natural Bone 7"
American Beefhide Natural Bone is an all-natural, long-lasting beefhide chew that your dog will love. American Beefhide Natural Bone is veterinarian approved for providing dental hygiene to dogs and can act as a great supplement to brushing or other dental care products. The Beefhide bones come in two sizes, this size is seven inches but a larger bone is also available that is . Beefhide Bones are a great way to keep your dog entertained and healthy, so order one for your pooch today! This product is a treat and not intended to be fed as a meal. Supervise your dog when giving treats. Always provide your dog with fresh, clean water daily. Wash hands with soap and warm water after handling any dog treat.